On Tuesday 29th January Harrow Way hosted its third Primary event in as many weeks and the Harrow Way Young Leaders didn’t disappoint. 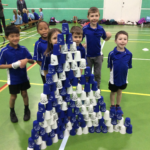 With over sixty Primary students and accompanying staff our Young Leaders help guide, coach and inspire their guests though twelve various challenges and games with each game was designed to improve motor coordination and teamwork. The afternoon was a great success with lots of fantastic feedback for our Young Leaders. Well done to all involved.